America’s most trusted seafood source for over 30 years is excited to announce a partnership with Aquarium of the Pacific’s Seafood for the Future program. Seafood for the Future will help Anderson Seafoods find suppliers who share a philosophy of sustainability, and provide scientific support and educational materials to assist the company in its efforts. We are excited to partner with the Aquarium of the Pacific in the Seafood for the Future program, which will help fulfill our sustainability commitments and educate existing suppliers as well as finding the ones who share our philosophy of sustainability. We strongly believe this will have a real impact in the marketplace, and ultimately in our waters. Creating more demand for seafood from sources that support healthy oceans puts us on course to improving fishing practices around the world. “Seafood for the Future was first impressed with Anderson Seafoods extensive sustainable seafood program and their direct relationships with local fishermen. We admire that they are looking to further improve upon their sustainable sourcing. 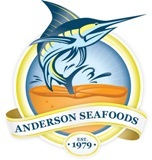 We look forward to connecting Anderson Seafoods with additional sustainable seafood producers to expand their current sustainable seafood product list through our partnership” said Melissa Carrasquillo, Seafood for the Future Program Manager. The aquarium’s team will provide Anderson Seafoods with scientific information and educational materials to help the company increase its purchases of sustainably wild-caught and farmed seafood. “Although we have made great progress on our sustainability efforts, the goal is to reach a point where a significant amount of all seafood purchases come from a sustainable source,” said Dennis Anderson, President of Anderson Seafoods. “As a leader in our industry, our company’s philosophy is to be at the forefront of preservation and aquaculture efforts to ensure the bounty of our seas for generations to come.” For a more in-depth analysis on this particular topic, we invite you to visit our sustainability section on our wholesale site: Anderson Seafoods. Seafood for the Future is a nonprofit seafood advisory program dedicated to its mission to promote healthy and responsible seafood choices. The program was founded in 2009 by the Aquarium of the Pacific with a generous grant from the Pacific Life Foundation. The program’s efforts have been acknowledged through partnerships with organizations like the National Oceanic and Atmospheric Administration’s FishWatch and FishChoice. In August, Los Angeles Magazine honored Seafood for the Future with the Earth Changer award. The program promotes transparency in the seafood system by providing a platform for discussion among members of the seafood industry, serving as a conduit of fact-based information on aquaculture and wild capture fisheries to purchasers, restaurants and consumers, and forming partnerships with concerned industry players to have the greatest impact on the seafood supply chain. Consumers can find responsibly sourced seafood at Seafood for the Future’s partner restaurants and retailers. See website for details: seafoodforthefuture.org.